Historically, the need for court-certified documents results from the seemingly contradictory need for the court to maintain possession and control of its official documents on the one hand, with the need for others — guardians, trustees, divorcees, and heirs, for instance — to be able to prove the existence and content of the documents to remote third parties, such as schools, banks, title companies, and so on. For centuries, in the paper-based world, the “user” of the document obtained a copy from the court, while the court retained the original. To enable the user to convince downstream, remote users of its veracity, the copy was “certified” to be a true copy, usually by signature of a court officer together with some form of seal presumed to be solely within the court officer’s power to affix. The theory was that any remote third party would recognize the court’s seal and the court official’s signature and be assured of the document’s validity. Leaving aside the flimsiness of this outworn fig leaf of security, for courts the process of providing certified copies in this manner is time-consuming and labor- intensive. However, courts can, and usually do, pass on the expense and perhaps even charge a bit more, because the value (indeed, necessity) to the user more than outweighs the cost. To recap then, the paper-based system of certification is expensive, labor-intensive, often slow, difficult to verify and extremely vulnerable to subversion. On the plus side, it is often a revenue maker for courts. Moreover, everyone — courts, users and remote third parties — is used to it. With the advent of Electronic Content Management (ECM), the time, expense and labor can be slashed and the vulnerability to subversion can be eliminated through the implementation of electronic document certification. 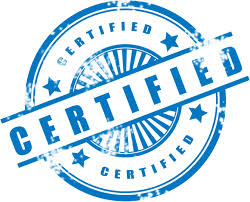 With tools such as TrueCertify™, certification is provided electronically through a secure Web portal. A certified document can be sent by email as a PDF, printed or both. The third party (bank, school, etc.) can review the original document for visual verification, which is considerably more secure than “trusting” an unknown seal and signature. One aspect that should not be overlooked, though, is that while it is (relatively) straightforward to identify and train people who are “close in” — court staff, attorneys, prosecutors, regular court users, and so on — the further away from the court, the more difficult it becomes. Therefore, the technology needs to be intuitive, and usable by an untrained user, which TrueCertify™ is. A somewhat unique challenge with implementing electronic certification is the involvement of remote third parties who are relying on the veracity of the certified documents — the schools, banks, etc. E-certification represents a paradigm shift, not just for the courts and its immediate users, but also for those downstream users. In order to assure the success of this transition, early, proactive outreach and education will pay big dividends down the road in getting all stakeholders, near and far, to understand and embrace the change. A clerk uses the TrueCertify software to create a special version of the target document that includes a unique certification page, while simultaneously uploading an encrypted copy to the portal. The certification page identifies the document and provides an encryption key and a link to the Web portal from which the original document can be visually verified. (The portal can be set up on the customer’s Web site or at www.truecertify.com.) Visit www.truecertify.com for more information.